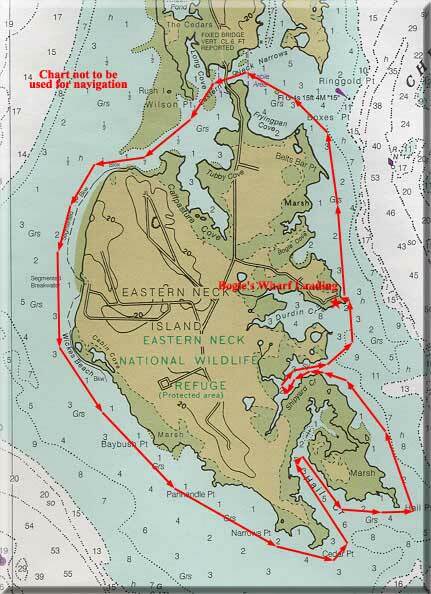 Circumnavigation of Eastern Neck Island National Wildlife Refuge. The trip begins at Bogle's Wharf, includes lunch at Hail Creek and ends at Bogle's Wharf. Because of some exposure to wind and chop on windy days, this trip is not recommended for novice paddlers. We'll depart from Bogle's Wharf paddling north along a marshy shoreline. Along this stretch and also to the south of Bogle's Wharf, paddlers often observe river otters in addition to numerous waterfowl and the occasional bald eagle. We'll paddle under the enchanting wooden bridge that connects the island to the peninsula, and from there, out into the Bay. We'll follow the shallows south to where the Bay meets the Chester River. During summer months winds come from the southwest so this leg can expose paddlers to considerable wind and wave action. The island has been eroded over the years, creating extensive shallows which produce short, choppy waves on windy days. We'll round Cedar Point and paddle into the depths of Hail Creek where we'll stop for lunch in the marshes. We'll then paddle out of the creek and round Hail Point. As we work our way back to Bogle's Wharf, we'll paddle into the quiet, marshy coves of Shipyard Creek before paddling on to the starting point.